copyranter: What flavor candy does black Disney princess Tiana like? Watermelon, of course. 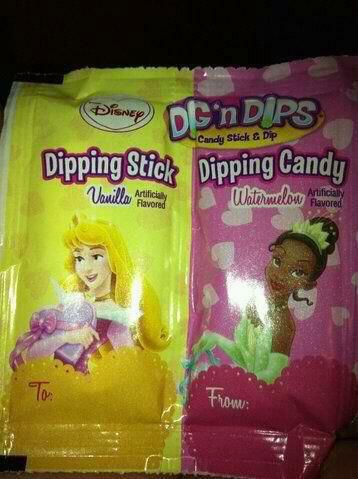 What flavor candy does black Disney princess Tiana like? Watermelon, of course. And, Cinderella Sleeping Beauty likes vanilla. Oh Disney, you so ditzy. I'm wondering if this is a real Disney product? That Cinderella looks, um, a bit more like Prince Charming in drag than a Disney princess. That's Sleeping Beauty with the vanilla flavor. Tiana's watermelon candy is great, Mulan's rice flavor is rather bland though. I don't know about anyone else tho, sociological implications aside, watermelon is the superior flavor. Goshh. I must be sheltered, I don't get it. Just so you know, the "via Sociological Images" link actually leads to myrightword.blogspot(one of your commenters). See, we do our research.